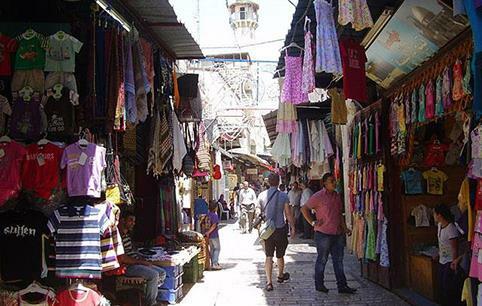 The main part of Jerusalem’s Old City Market is located in the Muslim Quarter, but the intricate market alleys overlap and go through of all four quarters of the Old City: The Christian, the Armenian, the Muslim and the Jewish Quarter. Enter the Old City Market, and immediately all your senses are surrounded: colors, scents and sounds will encompass you, coming from different directions, shops and alleys .Whether you are a tourist, a resident of Jerusalem or a bystander, strolling through the Old City Market is an incredible and stimulating experience. The Market is also a delightful culinary adventure, from small authentic Arab restaurants that lay hidden among the Market alleys, to the best hummus joints in Jerusalem, you will rarely be disappointed. If you have the time, you should come to the market onweekdays, since over the weekends the market is packed with tourists, and the shop owners are known to be excellent bargainers. If you plan to go to the market to buy fabrics, bags, shoes or jewelry, you should be able to get a lower price when it is less crowded. Inside the Old City market are a few special markets, including the Cotton Sellers market, also known as the indoors market. It has an architectural special feature, reflected by its edged arches. At the end of the cotton sellers market you will find the gate leading to the Temple Mount. The Cardo used to be one of the main streets of Jerusalem during the Roman period, and today you can find Judaica and jewelry Galleries. . And finally – the Muristan, located at the heart of the Christian Quarter.